Happy Friday! The little miss is home from school sick again today. We’ve been battling some nasty stuff here this week and frankly, I’m ready for it to be over with. I don’t think the two of us have slept a solid 4 hours in the last 2 days. Things are getting desperate over here. In spite of all that, I went ahead and made her a bento last night in the hopes that she’d be well enough for school. Her Kindergarten Thanksgiving show was this afternoon… actually it’s going on right now as I type this. I really hate that she missed it but I don’t think anyone would have enjoyed her incessant coughing, moaning, and nose wiping throughout the performance. I found this container when I was walking around Wal-Mart yesterday waiting for Cam’s prescription to be filled. It’s a simple plastic container with locking sides and is supposedly leak-proof, although we haven’t had the opportunity to test that out yet. I paid $3.47 for it. 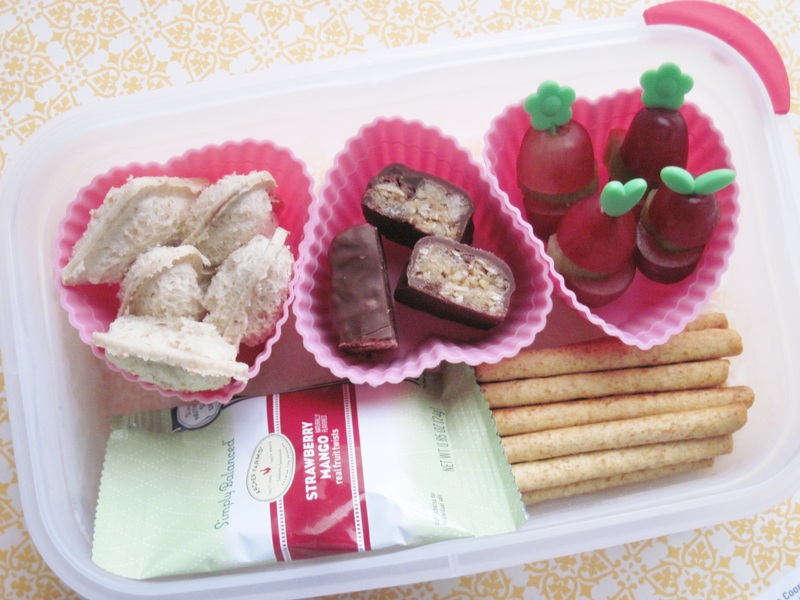 Another example of how you can use things other than actual bento boxes for lunch packing. For lunch today, I packed her favorite little heart-shaped sandwiches filled with chocolate spread. Next to those are a granola bar cut into thirds. To the right of those are food picks with sliced grapes and celery. Underneath I packed fruit snacks and Wheat Thin Sticks.